749cc dohc in-line 4-cylinder liquid cooled 4 valves per cylinder. Fuel injection with dual-sequential throttle valves. Catalyst. 6-speed stacked cassette gearbox, hydraulically operated multi-plate wet clutch with back torque limiter. Mass centralised exhaust with equal length headers. Aluminium composite twin-spar beam frame. 43mm usd cartridge forks with preload, compression and rebound adjustment. 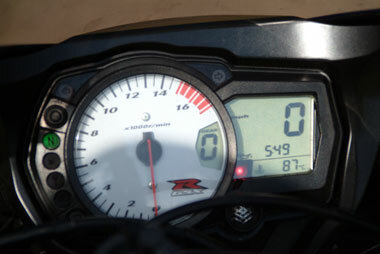 Rear rising rate monoshock with preload, compression and rebound adjustment. Twin front 310mm discs with 4-pot radial calipers and radial master cylinder, single rear 220mm disc with single pot caliper. still crazy after all these years. . . Some people don't understand the point of a 750. It hasn't got the power of a 1000 and it's bigger and heavier than a 600. So why bother? 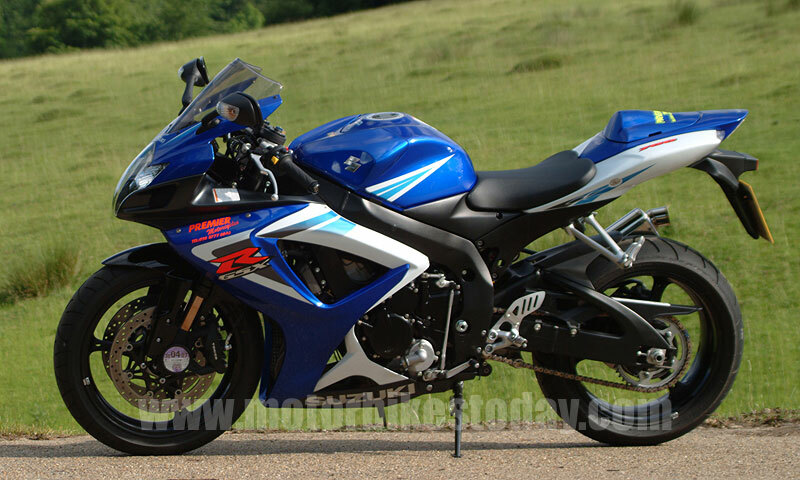 That question has always been moot when the GSX-R 750 has come into the equation anyway. Because historically it's been as light and agile as a 600 and it has never fallen too far short on the 1000's performance. Regulars may remember that we found the 750 to be lacking approximately nothing at all when compared back to back with both smaller and larger siblings. Far from it, in fact, as the 750 comprehensively spanked the others both on lap times at the Nurburgring and on general rideability. But time moves on, of course, and the game has been upped all round. The new generation of litre bikes, including Suzuki's own GSX-R, are highly capable and far more useable than they were just three years ago, as well as being quite astonishingly fast. And 600s produce even more power than they did before while retaining the flickability that they've always had. So who needs a 750 in 2006? Suzuki say that the GSX-R 750, as the bike that started the whole race-replica scene, will always have a place in their lineup. We applaud that as a rare gesture of emotion in an industry which tends to be run more on simple numbers - head ruling the heart. We also think there's a bit more to it than that, though. Because the GSX-R 750 K6, to give the latest model its full name, is a spectacularly good motorcycle. But I'm getting ahead of myself here. Let's look at it first. First impressions count for a great deal. And the first impression I got from the GSX-R was that there isn't a great deal of it. It's not only physically small, what there is has been pared down to the bare minimum as well. It's a neat trick, because despite the lack of stature the bike manages not to look weedy in any way. In fact, the overall impression is one of compact power. Think Barry McGuigan - a lightweight boxer and a little guy but with one hell of a punch - and you'll be getting the general idea. 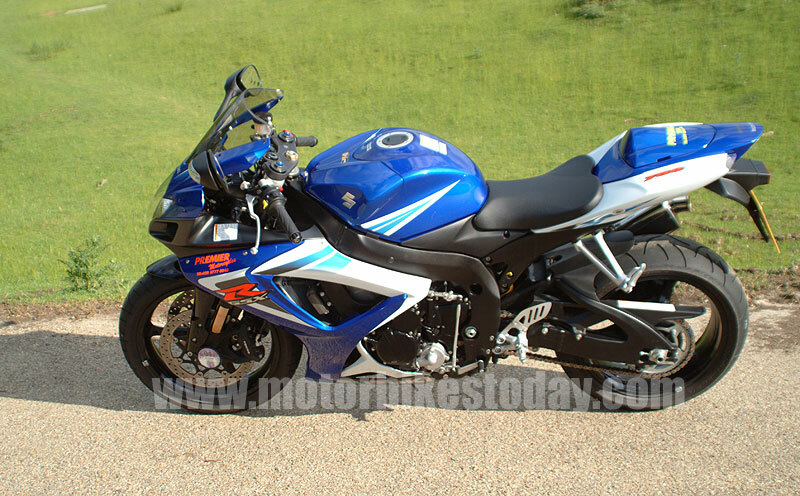 The new GSX-R is extremely slim and sculpted. 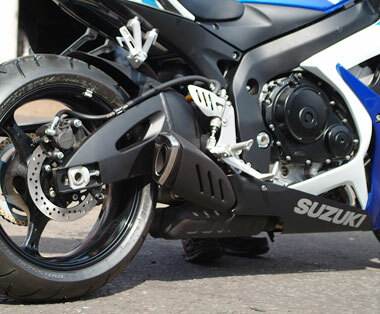 Suzuki have resisted the urge to follow fashion with an underseat exhaust, preferring instead to stick with a little stumpy pipe that exits near your right boot. The headlights are stacked as before, with front indicators mounted in the mirrors and the rear indicators are faired into the tail section as on the 1000. There are bungee hooks on the pillion footpeg hangers, though just fitting two is a little pointless. 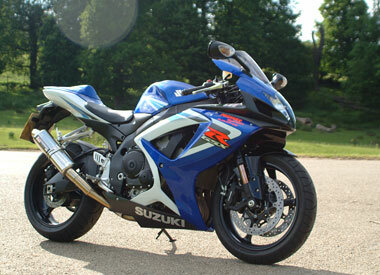 The pillion seat is interchangeable, as has been the case for along time on GSX-R's, with a streamlined plastic cowl. There is room under the seat, though not as much as with earlier models. I suspect you could get your waterproofs in there but it would be a squeeze. And it would rely on the alarm being fitted somewhere else. Anyway. On to technicalities. Suzuki have made some major changes over last year's model in a bid to lose weight and extract more power without sacrificing usability. Working from the top down, you get a higher compression ratio and the inlet ports are angled to allow them to be closer together. 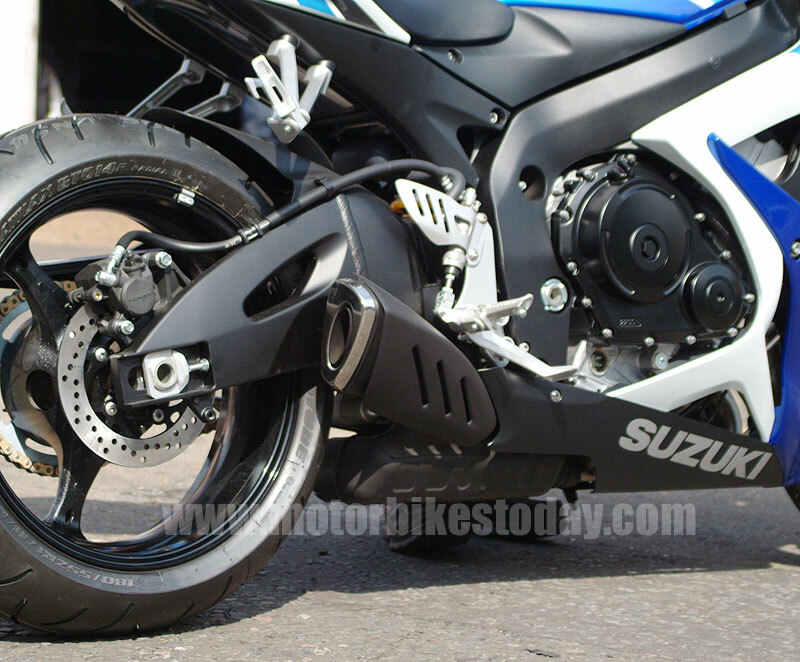 There's a second balancer shaft to further reduce vibration - which while it may sap a little power it allows the engine mountings and castings to be lighter instead, as well as making the rider's life easier. There's a slipper clutch and the exhaust lives under the engine, fed by equal length headers and keeping the mass where you want it - low and at the centre of gravity. The engine is overall 32mm shorter top t bottom, 16mm narrower and 60mm shorter front to rear, and it weighs a kilo less than the old model. The chassis has been similarly shrunk and is now 15mm shorter overall, 25mm lower and the seat is down 15mm from before too, making it even easier for smaller riders. Adjustable footrests, with three different positions, complete the major changes and make sure that everything stays as user friendly as possible. A new dash layout, though still retaining a family feel, gets a gear position indicator as well. You may think it frivolous but considering the popularity of aftermarket ones and the number of times that I, at least, try for another gear when I'm already in top, I'd say it's a good addition. Mirrors, always something of an afterthought on sportsbikes anyway, are really quite good. Not panoramic but certainly more than adequate as well as being sufficiently damped to stop them from buzzing and blurring too much. The ignition key now has Suzuki's version of the transponder based immobiliser fitted to most new bikes. Basically, without the right key talking to the black box, the bike won't start, meaning that a thief will have to replace the entire engine management and associated wiring - an expensive job as well as being easy to trace. Won't stop them getting nicked for spares of course but everything helps. Now the bike we're playing with is Premier Suzuki's demonstrator, which is nice of them. It's not totally standard, though, as it's fitted with a very nice (and totally approved) road legal Yoshimura can. Believe it or not, this is actually quieter than the standard one though I must confess I'm not totally convinced that it looks better. Anyway, everything is pretty well standard GSX-R fare, with all the controls where you'd expect them to be and the same old "pull the clutch in first" starting routine. Starting is as easy as you'd expect, the clutch is light and the gearbox is as smooth as we've come to expect from Suzuki. Pulling away and riding slowly demonstrates that the engine changes certainly haven't damaged flexibility in any way - the 750 is easy to trickle through traffic and pulls cleanly from low revs. The riding position at this sort of speed is on the sporty side of comfortable, with quite a lot of pressure thrown onto the wrists. But it certainly isn't too extreme for everyday use, and even with my knackered wrist and elbow I didn't suffer any discomfort so don't let it worry you. But most people don't buy a GSX-R for pootling around traffic. Though if you're after one as a commuter bike then it will do the job just fine. 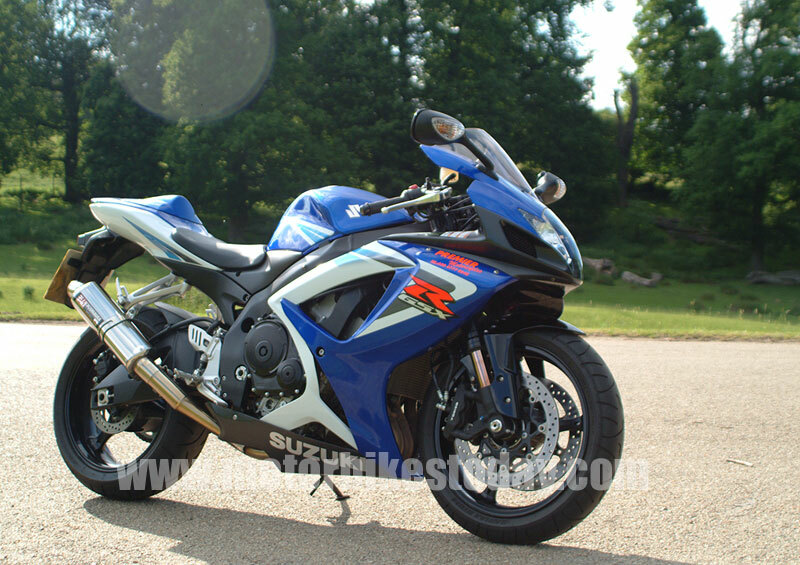 Outside the constraints of urban speed limits the GSX-R very quickly showed its mettle and dispelled any possible doubts that it may be worthy of the name. It's an extremely fast motorbike, accelerating way quicker than the capacity would suggest and holding just about any speed you may ask withoutfuss. Handling on regular road surfaces is impeccable, bumps and irregularities passing as nothing more than information to note but needing no action. Feedback is fabulous but never threatens to get scary and stability is just amazing. Braking is phenomenal and fuss free, the big (10mm up from last year) front discs scrubbing off speed and energy with surprising ease. And leaving the wider limits of the Queen's Highway for the test circuit revealed that, no matter how hard I pushed, there was always masses in reserve. Even approaching the limits of tyre adhesion, something I am still a little wary about after last year's demolition derby, the GSX-R felt smooth and predictable. When the back did start to move around it was enormously controllable and very easy to recover without a particularly elevated heartbeat. 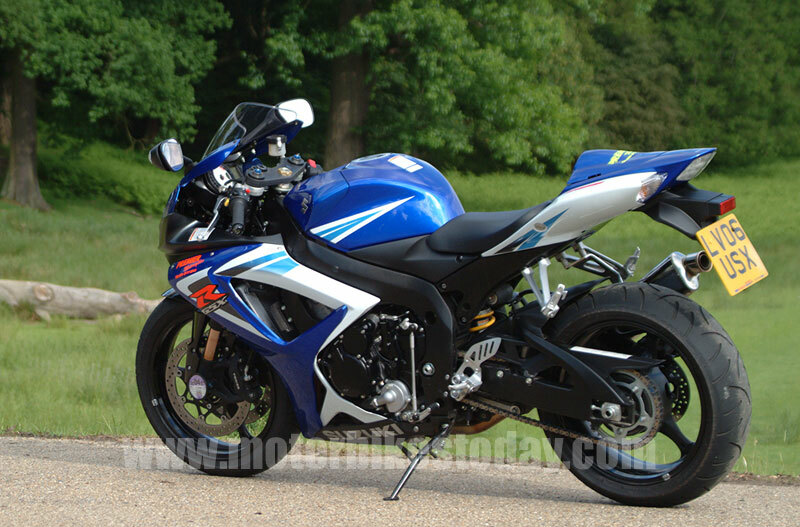 Over the couple of hundred miles we had the GSX-R for we threw it into every compromise situation we could find. Dodgy road surfaces, mid corner braking, forced changes of line, clumsy handfuls of throttle, braking deep into corners to simulate getting caught out on an unfamiliar road, everything. And it never once came up wanting. Probably a good thing as it would have hurt, but frustrating from my point of view as well. You see, I have a K4 and I love it. I'm desperate to find a reason not to like the K6 more than mine because that would mean I'd have to change bikes. And Suzuki's biggest crime with this motorcycle, in my eyes anyway, is that they no longer do a yellow one. Which just won't do at all. Thanks as always to Premier Suzuki in West Wickham, Kent, for the loan of their demonstrator.